Summary: Lucky Linderman didn't ask for his life. He didn't ask his grandfather not to come home from the Vietnam War. He didn't ask for a father who never got over it. He didn't ask for a mother who keeps pretending their dysfunctional family is fine. And he didn't ask to be the target of Nader McMillan's relentless bullying, which has finally gone too far. But Lucky has a secret--one that helps him wade through the daily mundane torture of his life. In his dreams, Lucky escapes to the war-ridden jungles of Laos--the prison his grandfather couldn't escape--where Lucky can be a real man, an adventurer, and a hero. It's dangerous and wild, and it's a place where his life just might be worth living. But how long can Lucky keep hiding in his dreams before reality forces its way inside? Can I just say that A.S. King has done it again? And, I'm so glad for her... and for me as a reader. 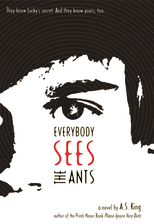 Amy's written another incredibly special young adult novel called EVERYBODY SEES THE ANTS. It's unlike anything I've ever read (which, as you know, isn't unusual for an A.S. King book) and it's already received four (that's right four) starred reviews from Booklist, VOYA, Publishers Weekly, and School Library Journal. I guess she's answered the question, "How do you follow up an award-winning book like PLEASE IGNORE VERA DIETZ?" EVERYBODY SEES THE ANTS tells the story of Lucky Linderman, a teenage boy who is kind of down-on-his-luck -- kind of ironic given his name! He has issues with his father, a grandfather who never returned home after the Vietnam War, a mother who is in denial about their family problems, and a school bully who won't leave him alone. In addition, his school is keeping a serious eye on him ever since he proposed a social studies project about teen suicide. Because Lucky recognizes that he is far from happy in his current situation, he finds the need to escape. And escape he does through vivid dreams that take place in Vietnam and star his POW/MIA grandfather. Through these dreams, Lucky not only imagines his grandfather is alive, but he also sees that he is capable of being a hero. Now, he just has to merge his dream world with his reality and learn to cope with his all of his troubles. I adored EVERYBODY SEES THE ANTS -- from the characters, to the story, to the symbolism, to the themes and messages, and even to the recurring role of "the ants." It was just a treasure to read. When I am blown away by a book, like I was with EVERYBODY SEES THE ANTS, it's sometimes hard for me to articulate my thoughts and present them in an orderly fashion. Suffice it to say that I loved this book. It was extremely original and refreshing, but at the same time, it was a little bit dark and thought-provoking. And I deeply appreciated many of the messages this story contained. I'm certain that I can't do the book justice in my review. And I'm even more certain that my review will only touch the tip of the iceberg when it comes to sharing everything this novel has to offer its readers. First and foremost, I want to mention the character of Lucky -- I loved him. As is the case with the other A.S. King books that I've read, Lucky is an extremely memorable character with a very authentic voice. He's sweet and has a great sense of humor and I do believe that kids will be able to relate to him -- in both the good and bad ways. He is an insecure teen who is feeling a bit lost, and as a reader (and a mom), I loved seeing how he matured throughout the story. Lucky's life definitely wasn't easy, but I was able to respect him so much for how he eventually handled the many problems in his life. Another wonderful thing about EVERYBODY SEES THE ANTS was that it explored some very serious, and relevant, issues. Lucky's character was experiencing some issues that many teens face in today's society like insecurities and distanced parents; however, he also was dealing with being the victim of a bully. I love that the author tackled this issue of bullying in this book so kids know that they aren't alone. And if they can use some of Lucky's personal experiences to help them deal with their situation, then even better. In addition to the bullying, EVERYBODY SEES THE ANTS also explored the idea of prisoners of war and soldiers who are missing in action. I'm not sure that we really address these issues with children and I do think it's important for them to understand that there are families out there who have to deal with not knowing what happened to their soldier. I felt as if this book tackled this important issue in a very clear manner and it's evident to me that Amy researched this subject prior to writing this novel. And finally, I'd be remiss if I didn't mention how incredibly talented A.S. King is. I really like Amy, but I have to tell you, I don't know how she comes up with the subjects of her novel. While I'm most definitely not a creative person, I really appreciate how "unique" (and I mean that in the nicest way) EVERYBODY SEES THE ANTS was. And I just loved the ants -- you'll have to read it to see what I'm talking about! Amy has the ability to tell gritty stories that will deeply affect you, but she also has the skill to create characters that are guaranteed to touch your heart. I think that's one of her most special skills. She writes books that change the way you see yourself and others. I know I gushed, but I really loved EVERYBODY SEES THE ANTS? It's a wonderful book by a wonderful author and I can't recommend it enough! Please stop by tomorrow because A.S. King will be stopping by to answer a few of my questions. Thanks to the publisher for sending me a copy of this novel. I love Amy, I love her books, and I cannot WAIT to read this one. Can't wait. Thank you for gushing. She deserves all the gushing she gets. I can't wait to see what she has to say. I've never read her books, but I want to. Creative and unique is one thing you don't find in just every book. Sounds interesting. I've only read her first book, but I really enjoyed it. Wow. This sounds like a book I need to read with the Vietnam War angle. Thanks for a stellar review. I'll have to find a copy next time I'm at a bookstore. Yay for Amy and another winner!! This sounds really interesting. And I was going to forward this to Serena so I'm glad she saw it! I'm very excited about this book and am relieved to see you loved it. I can't wait to see what you asked Amy!